Lama Rinchen Phuntsok — a student of Dudjom Rinpoche and his private secretary for 15 years. He is also a Nyingma teacher, scholar and meditation master. Born in Tibet, Lama Rinchen began receiving instruction in the traditions of Tibetan Buddhism at the age of six in Tsasum Chokhorling Monastery in Tibet. After he left Tibet in 1958, he studied at Young Lama's Home School in Dalhousie, The Buddhist Monastic School in Rewalsar, Nyingmapa Lama's College in Dehra-Dun, and Zongdog Palri Monastery in Kalimpong. Lama Rinchen graduated from Sanskrit University in Varanasi India where he completed advanced studies in Sutrayana Buddhist philosophy and scriptures, commentaries, logic, literature, history, and the major sciences of the Tibetan curriculum. 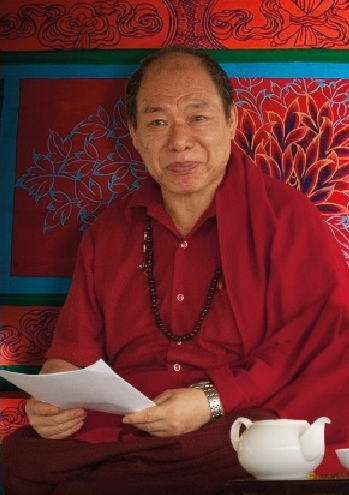 To complete his training in Vajrayana Nyingma School studies, he served as private secretary of Dudjom Rinpoche for over fifteen years. During that time he received all the important empowerments, transmissions, essential instructions, the oral teaching of Nyingma Kama, and the Profound Rediscovered Teachings of Terma. For many years, Lama Rinchen was in charge of Zangdokpalri Monastery in India and also Urgyen Dongag, Choling Monastery in Kathmandu, Nepal. In 1980, Dudjom Rinpoche asked him to come to the United States to teach in his New York center. Since then he has lectured widely throughout the United States and Europe at centers, colleges, and universities. Lama Rinchen visits his students every year in the United States (in St. Louis, New York, California, Colorado, New Mexico, etc.) and continues to spread the teachings of the Dudjom Tersar Lineage. This page was last edited on 5 June 2014, at 13:16.